In 2003 graduated Titu Maiorescu Faculty of Dentistry. Between 2004 and 2005 he was a dentist intern at Malaxa Hospital, He achieves between 2006-2007 Carol Davila diploma in “Competence in Dental Implantology by the Ministery of Healthcare“ at Ovidius University. Between 2007 and 2008 he attends “Health resources management” masters degree. In 2009 he achieves at Carol Davila a diploma in “Competence in Endodontics by the Ministry Of Healthcare”. 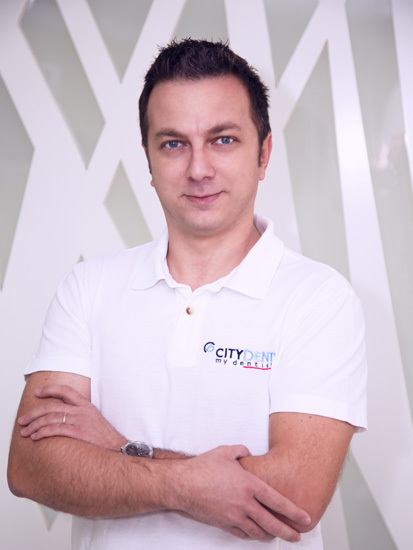 Since 2005 he is a member of Romanian College of Dentists and Bucharest College of Dentists. Dr. Nicu Dobrescu is a dentist dealing within the clinic with prosthetics: inlay, onlay, zirconium and full ceramic dental crowns.